You know it may not be your day when you just miss a train, Google maps point you in the wrong direction to Northampton bus station, and the BBC decide that they don’t recognise you on the Internet commentary. even though it was perfectly fine five minutes before. And of course you can’t remember your password. All of which means that I knew what happened during the first twenty minutes or so but had no idea of anything else going on until I got into the ground just in time to see the second wicket. 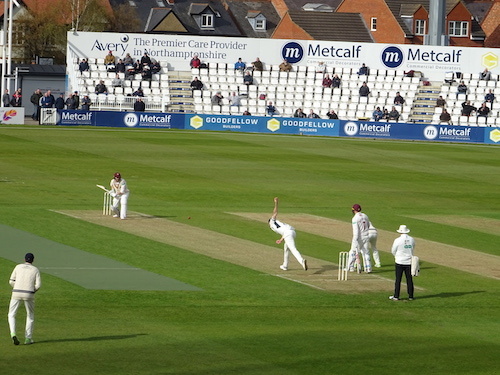 It would have been nice to have had a few more while I was roaming around Northampton but from the commentary I did hear and the look of the wicket, the pitch was definitely not an April green top. It was good to see TRJ in full flow again. He was running smoothly, bowling fluently and was unlucky with edges, and a dropped catch. (where are Ollie’s hands when you need them) It was good to see the bails flying for his wicket. Finny always needs to bowl to get into the groove and by the afternoon he was beginning to get there. Murts looked to be in the groove from the start. I jinxed James Harris by making him my bowler in the prediction game so he was bound to get no joy. Apologies in advance to Sam Robson. The fielding was keen. There were some good tumbling stops but one dropped catch and a distinctly unnecessary overthrow for three extra runs. Northants batted sensibly and positively. Rossington is one of those players who suddenly has twenty or thirty runs before you really notice. Jason Holder is a class act. He drove his second ball for a sweet four and didn’t look back. We bowled a number of no balls which is not something we normally do. Are umpires actually going to call them more this season? The scoreboards were fairly rubbish and there was no sign of an overrate indication. But there were various stoppages before I got there and we did not finish that late. There was a brief interlude of Malan and Holden just before the new ball. That may have been fixing the overrate or it may have been a light issue. The floodlights came on with the new ball. There were two trends we noticed. Firstly Murts got into a habit of bowling the last ball of the over of a very short run. Just the last ball. Discuss. And secondly the wickets seemed to fall with one relatively early in each session and one towards the end. No wicket clusters which seems to suggest the wicket rewards playing yourself in. 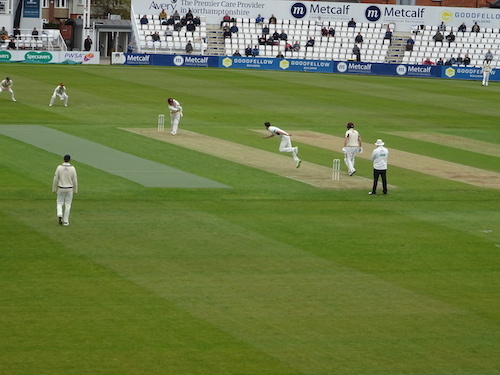 And the quirky moment of the day goes to Dawid Malan just after tea fielding in a very short, very straight mid on so he was, in fact, directly in front of Rossington as non-striker. Had there been a return catch, he would have been fighting TRJ for it. Only lasted an over or so but no idea what purpose it served. If you’re going tomorrow wrap up warm. Edited 1 time(s). Last edit at 2019:04:10:18:33:53 by BarmierKev. Can count around 50 hardy souls in the picture. Well done all.